DOING A RANDOM ACT OF KINDNESS. SPEAKING OUT AGAINST AN INJUSTICE. GOING OUT OF YOUR WAY TO HELP WHEN IT’S NEEDED. Such small, simple acts can light up someone’s day — but they also leave a more lasting glow. They prove that cynicism and selfishness are not the rule in our society. They remind us to seek and cultivate the best in ourselves. And they show that when we stand up for values such as kindness, fairness, and doing the right thing, we can each make a difference in this world. 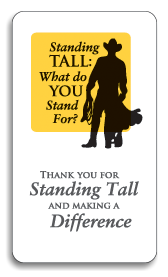 Our STANDING TALL cards are designed to recognize and celebrate the unsung ethical leaders in our midst. STANDING TALL cards can now be ordered in packs of 25. Click here to learn more. If you’ve received one, thank you for STANDING TALL. Please pass the card along to the next person you see making a difference. If you’ve given one, thank you for helping to spread the message that we can all be heroes in our own lives. Inspiring such quiet heroism is what the work of the nonprofit CENTER FOR COWBOY ETHICS AND LEADERSHIP is all about. You can learn more by browsing this website, starting with the home page. This campaign is an offshoot of our STANDING TALL ethical leadership workshops, where businesspeople, companies, and organizations take time out to define the core values they want to embody in their lives. To learn more, please download the workshop description by clicking on the “Download Workshop Information” link to the right.